Humans and dogs share the most common areas for the development of OA. 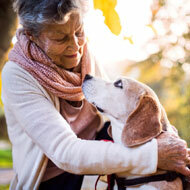 Key similarities between osteoarthritis (OA) in humans and dogs have been identified by researchers for the first time. Scientists say their findings, published in Nature Reviews Rheumatology, may be in part due to the shared lifestyles of humans and dogs. However, their similar disease physiology and anatomies could also play a role. The study was led by researchers at the RVC who conducted a comprehensive review of the existing literature related to OA. The team amalgamated more than 230 peer-reviewed studies into one single paper, ‘The spontaneous dog osteoarthritis - a one medicine vision. Researchers found that humans and dogs share the most common areas for the development of OA - the hip, knee, shoulder and elbows. They also identified similarities in the pain experienced by dogs and humans, suggesting that our nervous systems function in the same way. The team hopes that by combining this knowledge into one paper, it could lead to future collaborative studies by animal and human health experts. This ‘One medicine’ approach could then lead to new treatments to improve the welfare of both animals and humans. Dr Richard Meeson from the RVC, who led the research said: “Pet dogs live with us and develop many of the same diseases as humans, such as arthritis.